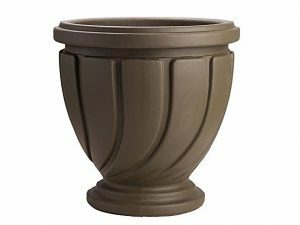 Blow-molded urn with soft ribs and elegant finishes, speaks to the "we want large planters" crowd. Has the real loaf of stone, cement, concrete, iron or even metal planters but at a low budget cost. - Blow-molded urn with soft ribs and elegant finishes, speaks to the "we want large planters" crowd. - Has the real loaf of stone, cement, concrete, iron or even metal planters but at a low budget cost. - This ultra-fine look with Novelty's new urn competes with heavy-duty competitors in stone, cement, concrete, iron or even metal.